Ukrainian Literature is a forum for translation into English of literary works written in Ukrainian. The primary purpose of the journal is to open the world of Ukrainian literature to a wider audience by acquainting English speakers who cannot read Ukrainian with the bounty and variety of writing in this language. 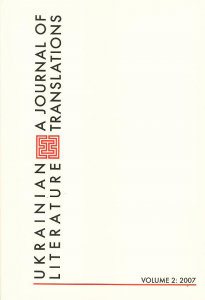 This journal is to reflect Ukrainian literature in all its breadth and diversity and includes works by a broad spectrum of writers, across a wide variety of genres and styles. It shows a strong preference for contemporary writing in Ukraine, but it will also publish translations of writers from the near and distant past. Publication was made possible by a grant from the Ivan and Elizabeth Chlopecky Fund of the Shevchenko Scientific Society (USA).